It seems there is precedent to allow for netilas yadayim when you don't have a cup, by turning the sink on and off for each rivi'is per hand. By employing this method you satisfy the requirement of koach gavra. What about a situation where the sinks are all automatic? Would waving your hand to turn on the sink still be considered koach gavra? 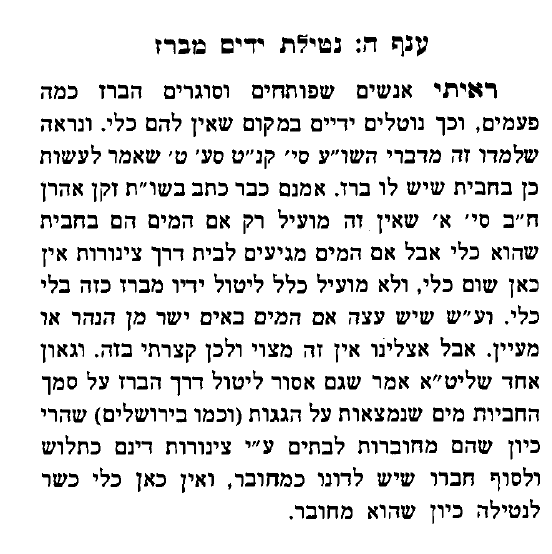 The Avnei Yashfei 30:5 writes that using a faucet does not count as using a kli since it is connected(to pipes) to the the house and has a din of being attached and cannot be considered a kli(utensil). So even turning the faucet on and off with your hands wouldn't help. Rav Eliyashiv holds this way as well and is also quoted in Ashrei Ha'Ish(Chelek 1:pg.203 the footnote uses this Avnei Yashfei as the source). Would waving your hand to turn on the sink still be considered koach gavra? Not the answer you're looking for? Browse other questions tagged halacha technology netilat-yadayim-washing electricity grama .